Back To Basics Yoga | Live The Life You Love. Namaste is used to acknowledge and honor the soul that is within you and the person sitting next to you. The gesture of Namaste in Yoga identifies that each of us has a divine spark that is unique and that should equally be respected. Saying Namaste is an expression that the soul respects and honors the other soul. It is a gesture to honor the light, love, truth, beauty, and peace within us. In a group yoga session, the Namaste gesture means that we are united and same. We act as a whole; we act as one. We join both palms together and place our hands at the center of our hearts – which signifies our soul. We close our eyes and bow our heads down with respect to the person in front of us. The reason for such gesture is because that the heart chakra is where all the divine flows through. It also increases this flow and in a similar way, vibrations of love and peace are passed on to the person we bow down to. In the West, this gesture is always accompanied by saying the word Namaste. In India, however, this gesture itself is so commonly used, that it automatically signifies that the person is expressing his Namaste, saying the word is not required. It is always significant that the gesture is accompanied by saying the word to avoid any confusion and increase the gap of communication. When performing the Namaste gesture to someone, it brings unity and connection through the flow of positive energy. Similarly, it releases grudges and any boundaries of ego. Focus on completely surrendering the mind and the heart as this results in a deep flow of gratitude where two souls unite and blossom. When to include the Namaste gesture in your Yoga practice? Namaste should be initiated at the beginning and at the end of the yoga class. In the beginning, it is used to express gratitude to yourself and to others – gratitude that each of you is present on that day. It also initiates the flow of positive energy during the remainder of the practice. Towards the end, it is again included to express honor and respect among each other’s souls. It acknowledges that with complete surrender, we are united and one. With this thought, the practice comes to an end filling our hearts and mind with joy, peace, and love for ourselves and for each other. For many yogis, their regular yoga practice and meditation tend to go hand in hand. Meditation can be an important part of setting intentions, practicing mindfulness, and reflecting on the more traditional elements of yogic philosophy. Some individuals even find it helpful to maintain a meditation practice and space that is completely separate from their regular yoga practice. If you’re considering diving further into the world of meditation, what should you know about the proper attire required? It can be a lot simpler to dress appropriately for meditation than for yoga, where wardrobe malfunctions abound. Here’s what you need to know about selecting the right outfit for meditation. This is perhaps the most important element of dressing for meditation practice. You will spend a long period of time sitting comfortably, so it’s imperative to find a pair of workout pants that allows you to cross at the shins and sit up comfortably. Many individuals prefer the feel of a pair of yoga leggings because they fit snugly against the leg muscles. This prevents bunching behind the knees when crossing at the shins. You should ensure that your yoga pants don’t hug your midsection uncomfortably and inhibit the flow of the breath. Breathing is an essential part of moving deeper into your meditation and practice and that’s why it should never be restricted by your workout clothing. If you’re practicing meditation separate from your yoga practice, a loose-fitting top is ideal. You won’t be moving through any sequences that require you to bend or invert your body, which means you don’t have to worry about unwanted exposure. A loose top, whether you choose a long-sleeve variety or a tank top, can help you to sit more comfortably and breathe freely in your meditation space. You may also opt for a wrap or blanket to cover your shoulder during meditation. Because the body isn’t moving or building heat, some individuals find that they feel chilly throughout their practice. It can be distracting to your overall meditation practice if you’re overly focused on your body temperature instead of your intentions. While you are ultimately trying to create a sacred space for your meditation practice, you want to be comfortable also. A good pair of thick socks can certainly help to regulate the body temperature, especially during the chillier months of fall and winter. Stand out with a jumpsuit. When many yogis think of meditation, the classic image of a flowing white robe tends to come to mind. Opt for a modern-day version of this traditional garb with a jumpsuit. Not only is it very comfortable and breathable while you sit on your meditation cushion, but it is also a very popular fashion trend. Look for subtle patterns or fun seasonal colors to boost your prana energy or alter your mood during your practice. With the right style and cut, jumpsuits can transition from your meditation practice into the workday or an afternoon out and about with friends. This comfortable solution to your meditation outfit makes it easy to incorporate this practice into other areas of your life. The boat pose is a popular yoga asana that works as an efficient ab strengthener and hip flexor. This is a pose that requires a great body balance because you will have to support your body weight on only your tailbone and sitting bones. Here are the best tips and steps on how to properly perform this pose. Sit down on the floor or on your yoga mat. Keep your legs in front, and try to maintain a straight position. Place both hands on the ground or on the mat just behind your hips, and press your palms slowly against the floor. Your fingers should point toward your feet. Both arms and both feet must remain straight. Keep your spine long and straight while you lean your upper body a little bit backward. Make sure your spine does not form a C shape or get round. Exhale deeply, slightly bend your knees and lift both feet off the mat. Your thighs must form an approximately 45-degree angle with the floor. Push your tailbone further into the yoga mat until you feel your pubis lifting up toward the navel. The perfect boat pose requires you to keep your legs straight while maintaining them lifted. Still, if you cannot do it, don’t force your body. Extend both arms alongside your legs, keeping them parallel to the legs. In fact, in this case, “parallel” is the key aspect that you must consider during the entire boat pose. Your legs must be parallel to each other. The same goes for your arms. Open your chest more and widen the space between your shoulder blades. If you cannot keep your arms lifted, you should rest them on the floor alongside your hips. During the entire pose, you should engage your abdominal muscles as much as possible. Your core area should remain tight and firm without getting too hard or thick. Pull the abs inside toward your spine and keep it flat. To keep your balance, you must press your tailbone as well as your thigh bones into the floor. This will help you anchor the boat asana. Breathe slowly and lift the top part of your sternum. Bend your head slightly in front and place your chin closer to your chest. Do this until the back part of the skull reaches up and away from the neck. It might seem like an easy pose, but it is quite challenging. Therefore, at first, you should maintain this pose for only 10 or 20 seconds at most. Then, you will gradually increase the period. In time, with practice, you can reach up to 1 minute or even more. To come out of the pose, you must release both legs while you exhale. Then, you can go back to sitting upright during an inhalation. The boat pose is a well-known abdominal strengthener. One of the most important aspects of maintaining this pose the proper way is to learn how to anchor your tailbone and thigh bones. Starting from there, you will be able to lift your upper body and straighten your spine. You practice your yoga regularly, and that is great. However, that means your mat is going to take a fair bit of abuse. The human body can be pretty gross, and when you exercise it can be even worse. Sweat, oils, dead skin, and other assorted microscopic nasty things get rubbed into your yoga mat every time you practice. It also gets put on the floor in numerous places, and when it gets rolled up it transfers everything on the floor to the top of your mat. That really isn’t pleasant to think about while you are sitting in Child’s pose, and your face is on the mat. Thankfully there are a few simple things you can do to keep your mat clean. The most important way to keep your mat clean all the time is to quickly wipe it down after every use. When you do that, your mat gets much less of a chance to build up significant dirt and oil. A spray bottle with diluted vinegar is a suggested cleaning agent for freshening your mat. The vinegar should be mixed with water with a ratio of about 1 to 20 to provide proper cleaning power, while not being overly vinegar smelling. To clean just spray down, let soak, and then wipe down. Do this on both sides, and then let it dry. It shouldn’t take too long to dry. If it takes more than two minutes or so to dry, then you have used too much. A light spray is all you need. In this video, you can find out how to make a homemade yoga mat spray. It is easy! In the event that you have gone a little too long without cleaning your mat regularly, you may need to do a deep cleaning. Even if you do gently clean your mat regularly, you still may want to deep clean your mat once every 3 months or so. A good rule of thumb is that your mat should be soaked and hung up to dry every time the seasons change. To deep clean your mat you will want to fill a bathtub up with warm water, about two or three inches is all that you need. In that water, you want to add about an ounce of dish soap, and then give it a stir. Place your mat in the water, making sure that it is completely submerged, and then let it soak for 5 minutes. The dish soap is going to dissolve the oils that your skin leaves on your mat, and soaking lets the soap get deep into the material. Rinse with warm water to remove the soap residue. Finally, to dry your mat, hang it up. A good place to dry your mat is on a close drying rack or hanging it over your shower curtain. Drying after a deep clean will take a while because the water would have been absorbed. Check out this video to learn how to clean your yoga equipment and save the money! Yoga mats can get dirty very quickly, and that is gross. However, quick wipe downs and the occasional deep clean can keep it fresh. Remember, you place your face on this mat, and you probably want to make sure it is clean. When I am tired, stressed, and ready to end the day I turn to certain yoga styles and avoid the more fast paced and strenuous styles. These are three of my favorite night yoga styles that recommend to try at least once. In general, these styles offer slower, cooling, and more passive poses. It does depend on the teacher, but try to explore different classes and don’t give up if you don’t like the first one that you try! There was a teacher who would teach Yin Yoga where I used to study. They were usually the latest class on the schedule. I looked forward to these classes because it was super relaxing and I had a stressful job at the time. The unique thing about Yin Yoga is that it is a completely Passive practice. Yin yoga goes through a series of stretch poses and lets you stay in one pose from 1-5 minutes at a time. So Child’s Pose could take up to 10 minutes! It works by allowing the stretch to enter into your deep tissues. It also develops a release quality as you are instructed to completely let go, instead of engaging muscles you release them. Gather pillows, and props to help you release no matter what level you are at. The great thing is that this type of yoga allows you widen and advance your hip poses including the “splits”. The Moon Salutation is different from the Sun Salution (Surya Namaskar). It will help you to cool down, rejuvenate and relax. This sequence is designed for the night time, and for honoring the moon cycles. The Moon Salutation goes in a different direction than the Sun Salutation. It starts on the right side of the mat, we move sideways, and then end on the left side. The sequence is repeated the opposite way, ending on the right side. There are different versions, which I encourage you to try both traditional and modern. The famous yoga teacher Shiva Rea teaches her version with before and after meditations and a lunar theme chanting option for each pose. This sequence acknowledges the need for a balanced harmony between our hot and cold energies. When you balance these energies prepare yourself for a spiritual union. The Moon Salutation poses include: Standing Sidebend, Goddess Pose, Triangle Pose (Trikonasana), Malasana. Anahatasana, Anjali Mudra, etc. The traditional lunar chant is “Om somaya namaha”. 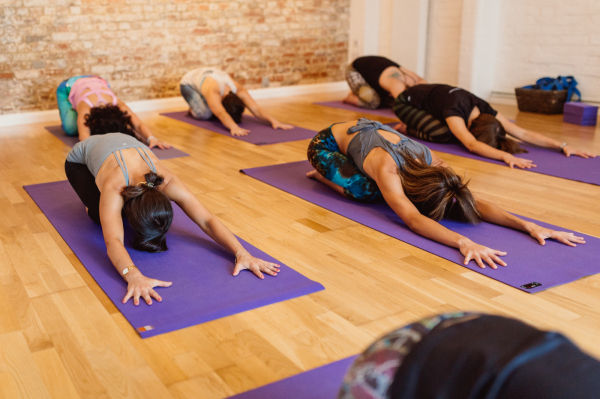 Hatha Yoga focuses on balancing energies and connecting consciousness with your vital forces. In a slow Hatha class, low intensity poses work to cool the body and the mind down. These can range in level and intensity, but the slower ones are great for late nights when you want to tune into your breath, body, and become more mindful. The teacher will guide you through holding a pose while breathing and often offer pure breathing exercises. Guided meditations might be used or a simple meditation at the end. Common poses include floor poses, cat and cow, and inversion poses. Have a blanket ready in case you get cold during Savasana Pose (typically the last pose of the class). To sum up, look out for these classes Yin Yoga (Passive), Moon Salutation (Moon Inspired sequence) and Slow Hatha (slow paced Yoga with breathing and meditation). Give your self permission to indulge in some relaxation and reconnection of your mind, body and Spirit. Also make sure to wear comfortable yoga leggings because you will feel better; you can shop some of them here. If you are a recent yoga enthusiast, you are most likely overwhelmed by the various different types of yoga styles. This article is dedicated to reviewing, explaining and informing you about Anusara Yoga. This is a modern Hatha yoga system founded by the American John Friend. Anusara generally translates to “Go with the flow”, “Follow your heart” and “Flow with grace”. It is based on the Tantric philosophical system with principles of arrangement. It is one of the fastest growing and popular styles in the modern world. The main focus of this style is to experience joy in your daily life within the yoga practice. Originally found by John Friend in 1997, this style focuses on life as a gift, and its goal is to make us remember and celebrate that fact through the yoga practice. The base philosophy Anusara’s Yoga roots stand in is the assumption that all human beings are inherently good. The “Universal Principles of Arrangement” stand as a core in its practice and give guidelines on how to align your heart, body, mind and soul in such a way that it integrates a circulation within you which optimizes your strength, health, and general well-being. Finding the most important tools and using those principles stand as the most important factors of its practice. Most common practices taught by Anusara teachers are the holding of a particular, specific key-pose for a longer period of time. The Vinyasa flow helps your breathing and teaches you new breathing methods which guide you to your asana practice. This helps to warm your body up and enables you to express yourself physically and release yourself from negative forces. While this might sound hard to grasp as a concept at first, the Anusara style is built in such a manner that actually benefits the beginner students the most as instructors and yoga teachers will mostly not try and physically fix the student’s pose, but give them the guidelines on how to properly use the principles of alignment. There are no actual “fixed poses” due to the nature of the style guiding the expression. Classes are usually finished with meditation to help relax the body and the mind. What Are the Pros to a Regular Anusara Yoga Practice? As in most types of yoga, this will also help you strengthen your body and mind, but also make it more flexible, help both physical and emotional injuries be healed faster, fix imbalances of any type that were previously naturally adopted by your body such as the wrong posture due to various reasons such as not sitting properly and so on. The main idea is to practice with awareness, intention, and emotion. Following these simple guidelines will help you improve tremendously, but the main benefit is your mind and heart being helped evolve to a new level of spirituality and balance.